Pretty sterling silver and 18k yellow gold lockets that can be filled with birthday stones to celebrate mom's family. A hinged, glass front window allows her to see the birthday colors. Available in 3 styles and a choice of 4 stone sizes/types. They are so adorable! Our newest kids are now available in 14k yellow gold or sterling silver. Choose from a baby boy or baby girl design in two sizes. The small size is perfect for a charm bracelet. There are even twins designs... girl and girl, boy and boy or boy and girl! This fun collection also includes a more modern version of a mother cradling her child... choose from mother and son or mother and daughter. A few diamond items are also available. Click here to view selection. 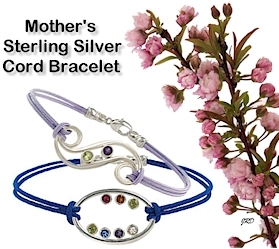 Birthstone bracelet designs for mothers... it's a fun and stylish way to celebrate being mom! Crafted in sterling silver with sparkling genuine or simulated birthday stones. Choose from two styles- an open oval design or a swirl with a peapod shape center. Each bracelet ordered comes with a colorful cord bracelet with sterling silver clasp and an optional sterling silver bangle is also available. A charming Black Hills Gold tree design has just been added. What is unique about this family tree design is that if a stone is not set in an available location, it has pretty pink or green leaf "fillers". 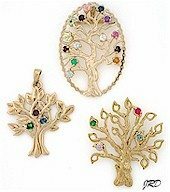 Choose from three lovely family tree designs. Custom set with stones to represent the birth day of each family member. Click here to view the collection.